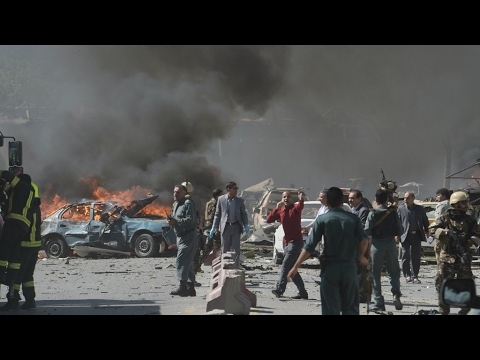 A powerful vehicle bomb has hit the diplomatic area of the Kabul. The blast reportedly claimed the lives of at least 80 people and injured another 350. Civilians are said to make up a large number of the casualties. The bomb, which struck near the German embassy in Zanbaq Square, was so strong it blew out windows and doors hundreds of meters away. It detonated in the diplomatic quarter at about 08:25 local time during rush hour. Kabul police spokesman Basir Mujahid, told Reuters that the explosion had taken place close to the German embassy, but added it was “hard to say what the exact target is.” Since there are many other important buildings in the area, including the presidential palace and a number of embassies. Improvised ambulances transported the wounded away from the scene, as frantic relatives gathered at the site to try to locate loved ones. The Taliban and the Islamic State are the main suspects. However, the Taliban promptly issued a statement denying any involvement, while the Islamic State remains mum. The IS claimed last month’s suicide bomb attack on the Nato convoy near the U.S. embassy, which killed eight civilians. Spokesman Zabihullah Mujahid said the Taliban condemned untargeted attacks that caused civilian casualties. Their spring offensive detailed that their main focus would be foreign forces, targeting them with a mix of conventional, guerrilla, insider and suicide attacks. The U.S. has approximately 8,400 troops in Afghanistan and 5,000 Nato allies.